I’ve switched both of my machines (12″ Powerbook and Intel iMac) to Leopard now, and I’ve run into my first major application loss. QuickSynergy no longer works for me. My workstation setup is a 20″ iMac on the right, with a Windows machine hooked up to a 20″ LCD directly to the left. I use the Windows machine for 3D modeling and rendering. Having both machines on the desk lets me use both systems without having to reboot my iMac or run a virtualization program. I use Synergy to control both computers with one keyboard and mouse. If you haven’t heard of Synergy, and you use more than one computer at a desk, check it out immediately. It’s nearly life changing. 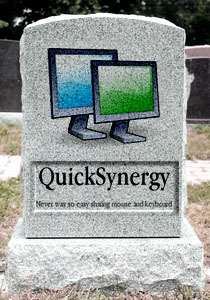 QuickSynergy is a great GUI for using Synergy on the Mac or Linux. Before QuickSynergy came along, everything was command line. Well, QuickSynergy doesn’t seem to play nicely with Leopard. My Windows machine won’t connect to my iMac as a Synergy server, and when I try to quit QuickSynergy I get an error mentioning something about Applescript. I’m going to try using the command line Synergy setup, but if that doesn’t work it looks like I’ll be rockin’ out old-school with two keyboards and two mouses (mice? mii?) on my desk. If anyone has run into this and knows a solution, please enlighten us in the comments!